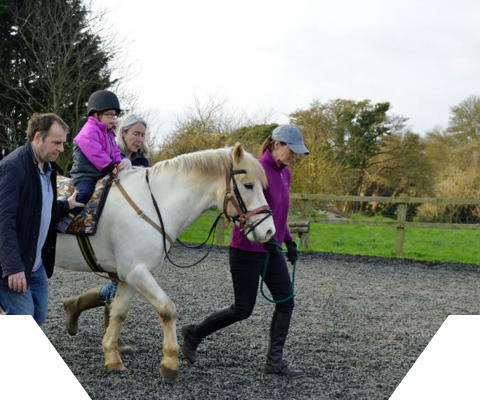 Our horses are all very different characters - matched carefully with our riders. 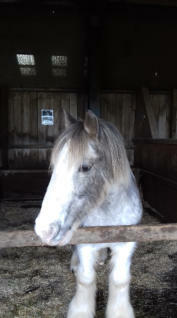 Polo is a 13.1 welsh-cross strawberry roan. He is almost grey in the summer and has a much darker flecked coat in the winter. 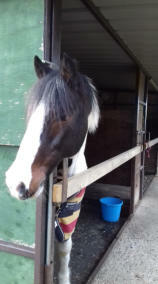 Polo came to us after having some fun and experience as a Pony Club all-rounder. It is best to keep calm and quiet with Polo - he has some good memories that he would sometimes like to refresh. Polo is a great fun ride who also loves kisses and cuddles. Candy - loves the boys and is a real beauty. She is a great favourite with the volunteers and riders but can be a bit of a handful when led down to the field after day in the yard. Mr Brown is an extremely popular ride. 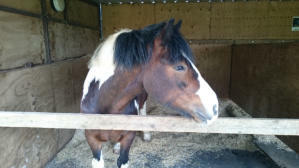 He had some early problems with lameness but seems to be over it now, thanks to a bit of tender loving care and therapy. Speckles was 5 years old when we bought him in 2000. He rides and drives and excels in everything. 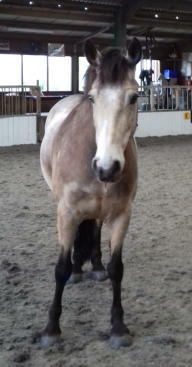 Everyone loves to ride him – he is the perfect pony. 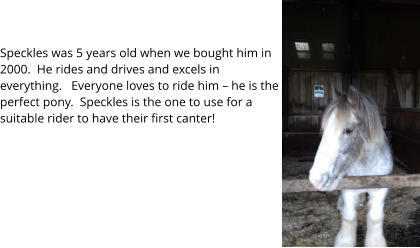 Speckles is the one to use for a suitable rider to have their first canter! 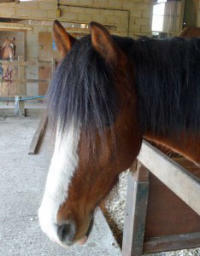 Jim Bob 14.2 and 6 years old (2016). Jim Bob came from a riding school where he was competing with the younger riders, doing sponsored rides and taking nervous adults out on hacks. 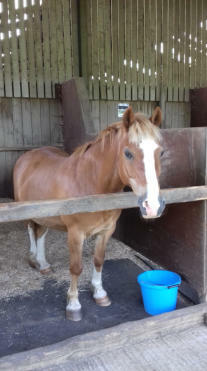 Bryn is our smallest pony but he walks out beautifully - short legs don’t necessarily mean slow! Bryn is a cheerful chap who is ideal for our smaller riders. 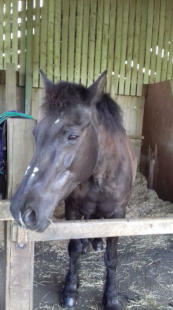 Jasper, purchased in May 2017 (12years old at the time), 13hh. 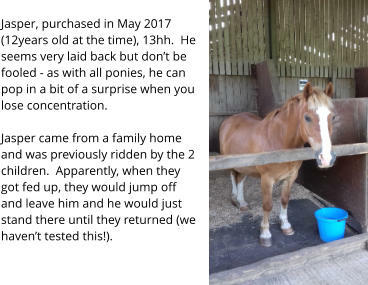 He seems very laid back but don’t be fooled - as with all ponies, he can pop in a bit of a surprise when you lose concentration. Jasper came from a family home and was previously ridden by the 2 children. Apparently, when they got fed up, they would jump off and leave him and he would just stand there until they returned (we haven’t tested this!). 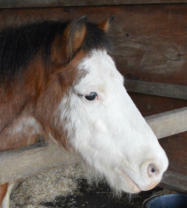 Ranger has just been purchased by Libby’s parents for group use (although Libby will have priority in her lesson). Ranger is quickly becoming very popular with the better riders. He is a super, responsive pony. As you can see, just a tad nosy! before she came to us and is happy to please and is enjoying being with us. Everybody loves her - she is going to be very popular. Prinnie or Prin - Princess is her real name. Prin came to us in 2018 and at present she in on a 6 month trial. She is a gentle soul who loves poeple and company. she is going to be very popular.